Mirage Hair Building Fibers is a unique complex of pure keratin protein. These microscopic hair fibers build upon your existing hair. To produce dramatic density and volume and total undetectable coverage to your thinning and balding areas. Mirage is manufactured in Canada. It is completely safe. Finally a natural way of eliminating the appearance of baldness and thinning hair. Mirage hair-building fibers will change the way you look in seconds! mirage is applied without the mess, by simply shaking the bottle container over the thinning areas, releasing thousands of microscopic hair keratin fibers. These fibers intertwine with the existing real hairs. Watch your hair look thicker and full in less than 15 seconds. Even your thinnest areas become thick and full before your very own eyes. It blends and bonds securely with your existing hair. 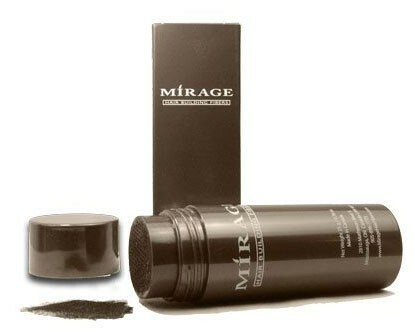 As you apply Mirage to your scalp, you will see your thinning hair and bald patches vanish before your very own eyes. Mirage Hair-Building Fibers has succeeded in providing a product that satisfies everyone that wants to look feeling young and beautiful. Your hairstyle could change with age, let Mirage Hair Fibers, make you feel different about yourself and let you keep that style you want. And say Au Revoir to those thinning hairs and bald patches forever. An All-Natural Solution For Both Men and Women. 25 Grams for 60 day supply. Mirage Hair Fibers is available in 7 colors to choose from Light Brown, Gray, Dark Brown, Blonde, Black, Auburn, and Medium Brown. An All-Natural Solution For Both Men and Women. Mirage Hair Fiber is made from the same organic Keratin protein as your own naturally growing hair, so it’s completely safe, and an all-natural solution for both men and women. You apply MIRAGE Hair Fibers by simply holding the container over your thinning area, and shaking it gently. In seconds thousands of Mirage color matched hair fibers will intertwine with your existing hair giving you the look and feel of thick natural hairs.